In the public sector and industries like energy, retail, banking, and telecommunications, organizations increasingly rely on business-critical applications that must be deployed with limited space, budgetary constraints, and scarcity of skilled IT staff. They must extend the reach of these applications from datacenter core to edge of the network with reduced complexity on the infrastructure that best meets their IT requirements. 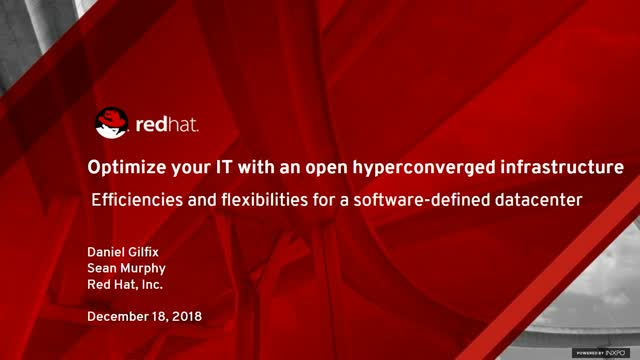 Red Hat’s innovative approach to addressing these issues includes Red Hat® Hyperconverged Infrastructure for Virtualization, which provides flexibility and choice for customers seeking low-density, infrastructure consolidation based on our leading virtualization platform. Red Hat Hyperconverged Infrastructure for Virtualization is streamlined with Red Hat Ansible® Automation and is based entirely on code from the open source community. > Market dynamics and challenges customers are facing with too much required by too few resources in too short a period. > The emergence of hyperconverged infrastructure as an alternative to inefficient segregated infrastructure. > Why hyperconverged infrastructure operational processes are more effective. > How an open source subscription model can facilitate maximum benefits of infrastructure consolidation.